Jam Jams are flavourful, simple cookies, with sweet jam in the middle. 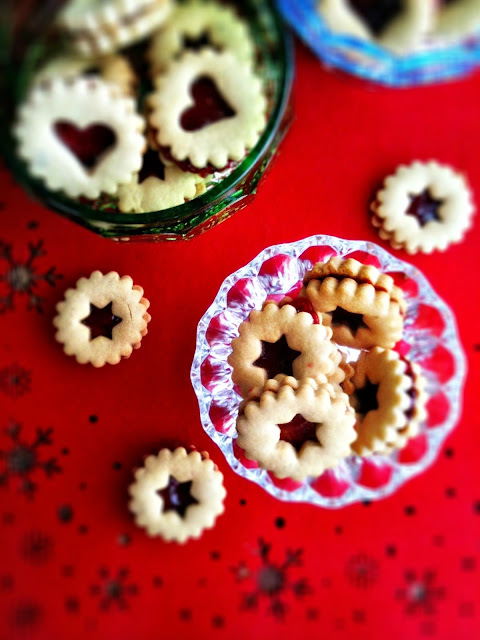 Mom said they are an old German cookie (my ancestors came from a German-speaking part of Russia), and she remembers going to her grandmother's kitchen and watching her make them. Jam was either home-made or plenty cheap. Mom said you could get a huge can of jam for $2, with strawberry or raspberry being the flavours of choice. Originally the recipe called for lard instead of butter, most likely because they raised their own pigs and would have rendered fat in the kitchen for daily use. 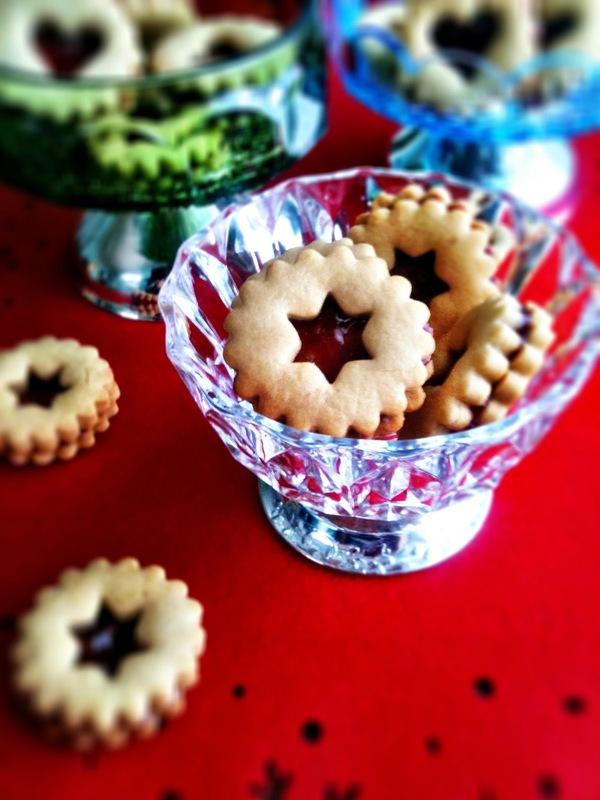 Cost-effective and delicious, these cookies were always around at Christmastime. My great grandmother has been gone a long, long time, and I never even got to meet my own grandmother as she passed away just months after my mom was married. While these are fabulous cookies, I know too that mom makes these as a way of remembering her own mother, who died too soon, too long ago. For that, I cherish this heirloom recipe even more. As with most of my mom's recipes the steps are a little loosey goosey. Renee: how much flour do I add? Mom: just enough to make a soft dough. Renee: how thin do I roll them? Mom: not too thin. Renee: how long do I bake them? Mom: until they are done. Oh mama. Good thing I've got everything nailed down for you guys. The fun thing about this recipe is it's good for small hands who want to help. Get the little people in your life cutting or jamming or sandwiching. I totally remember getting jam in my hair after helping out with these cookies. Okay, so let's be jamming! Make the dough, which is very simple, butter (unless you have your own rendered pork fat kicking around), brown sugar, Roger's golden syrup, eggs, vanilla, baking soda and flour. All staples to be found in a kitchen in rural Sask circa 1930, 1960 and 1989. According to my ma, the dough is best if it's chilled for 2 hours or overnight. If you do the overnight thing, just remember to leave it out about two hours before you want to roll it out, thin, but not too thin. Use whatever cutters you like. We grew up with them being large and round, but I found these cute cutters for a steal, so mine are small and full of hearts and stars. As soon as the cookies come out of the oven - my small guys only took about 7-8 minutes to bake - have your jam hands ready, as the cookies need to be sandwiched while still warm. 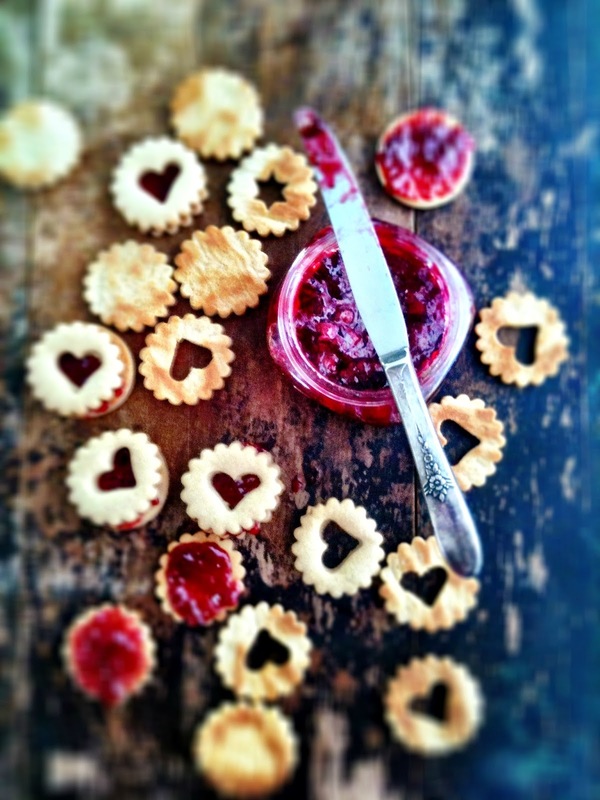 Spread a little jam on the plain base and top with your decorative cookie. You've officially made Jam Jams. They will get softer as they sit in a container, so if you think you might have over baked them, never fear, they will soften still. Jam Jams are great to bake ahead as they will last in the freezer for a few months, but if you are like me, you will find them and wait a whole 30 seconds before biting into one. I love these cold, with a glass of milk. This table, where I take almost all of my photos, belonged from my Grandmother, and I have a feeling she'd be quite pleased to see her mother's recipe appearing here today. Cream butter and sugar together until fluffy. Beat in corn syrup for a minute, then eggs and vanilla. Beat until light, about 2 minutes. Stir in baking soda and gradually add flour, one cup at a time. I added 4 cups total, but it was too much, so start with 3 and a half cups of flour. If it seems too wet, add a little more. According to mom, the dough should be quite soft. Scrape into a bowl, cover and chill for at least 2 hours or overnight. Lightly flour your counter. Pre heat oven to 350*F. Roll dough out until thin, a little less than 1/4 inch. Cut into your desired shapes. Place these on a parchment-lined bake sheet. Bake for 7 minutes if they are small like mine, or longer, if they are bigger. Cookies should still be soft in middle, but starting to brown around edges. 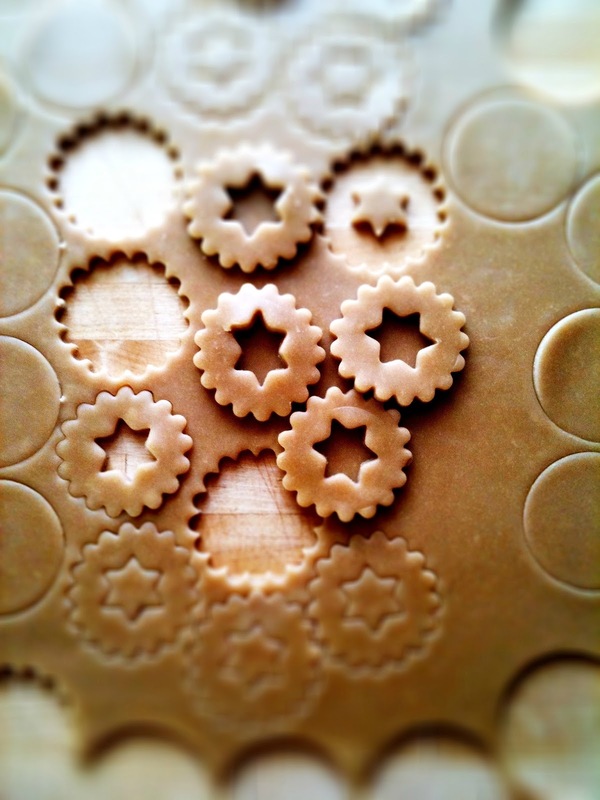 Remove from oven and immediately spread jam on one "base" side and top with the more decorative cookie. Set aside to cool and repeat process until all the dough is rolled out and baked off. Store in an air-tight container at room temp for a few days, or freeze for up to three months. Makes about 4 dozen small cookies. Wow Renee, stunning photos. Your cookies sound delicious - thanks for sharing. I'm in love with how cute these are! 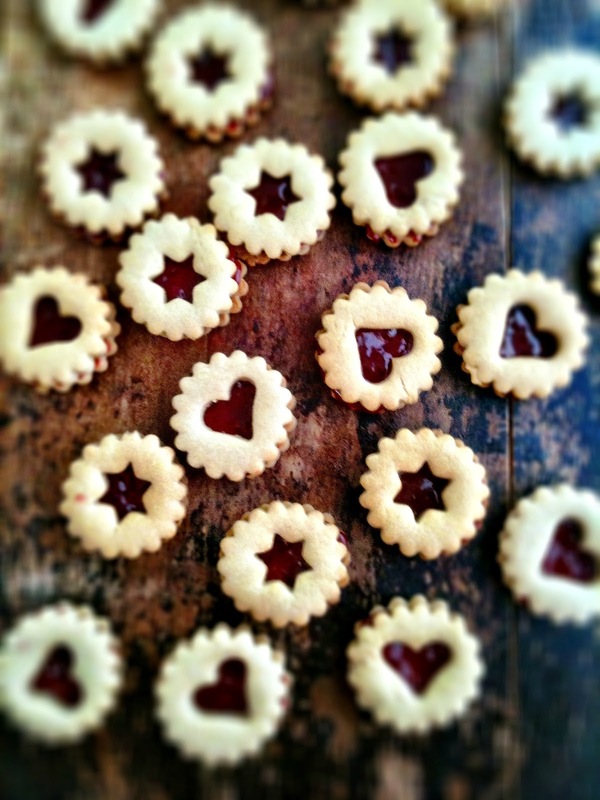 I know these cookies as Spitzbuben or Linzer cookies. The recipe is slightly different but that's probably due to locality. These sound delicious. I think that keeping up family traditions is so important. My mom and I bake together one night a week leading up to Christmas. 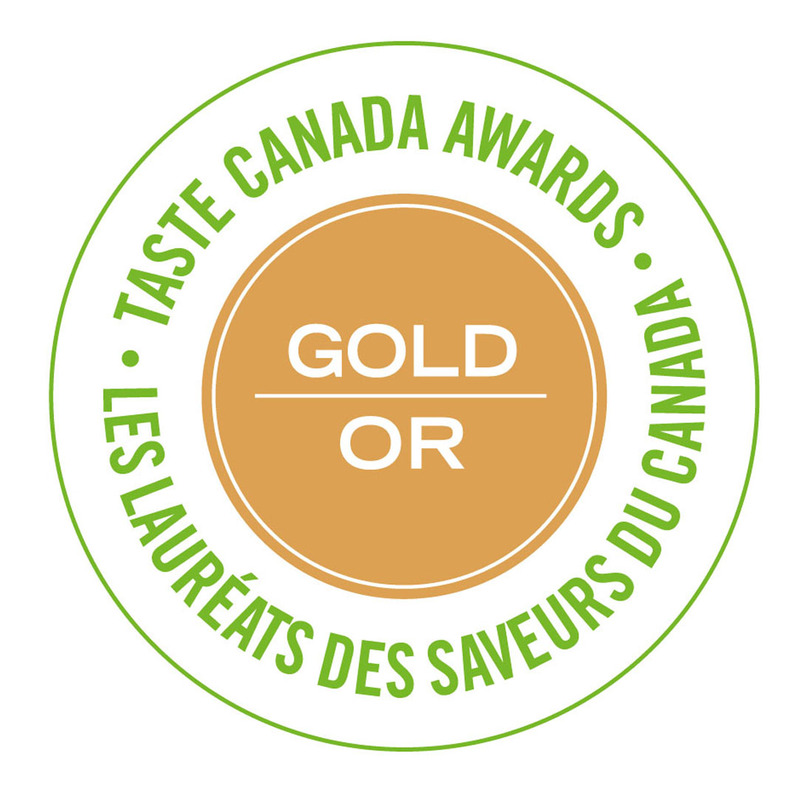 Our traditional cookies include gingerbread, German buttercake, whipped shortbread, sugar cookies (that we used to paint with coloured icing sugar as kids) and baklava. We also make my great-grandmothers cinnamon buns for Christmas breakfast. Lots of other recipes have come and gone over the years, but these always are on the list. 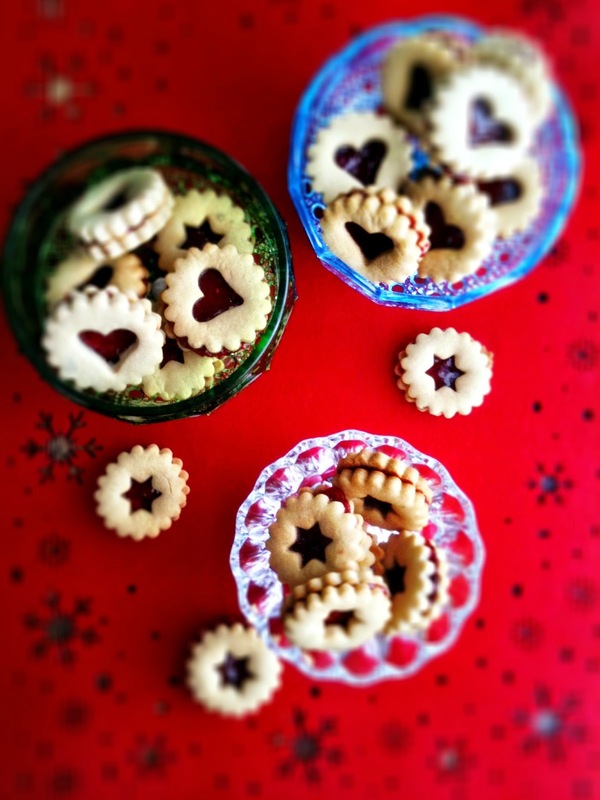 Those little cookies are just so perfect and lovely! 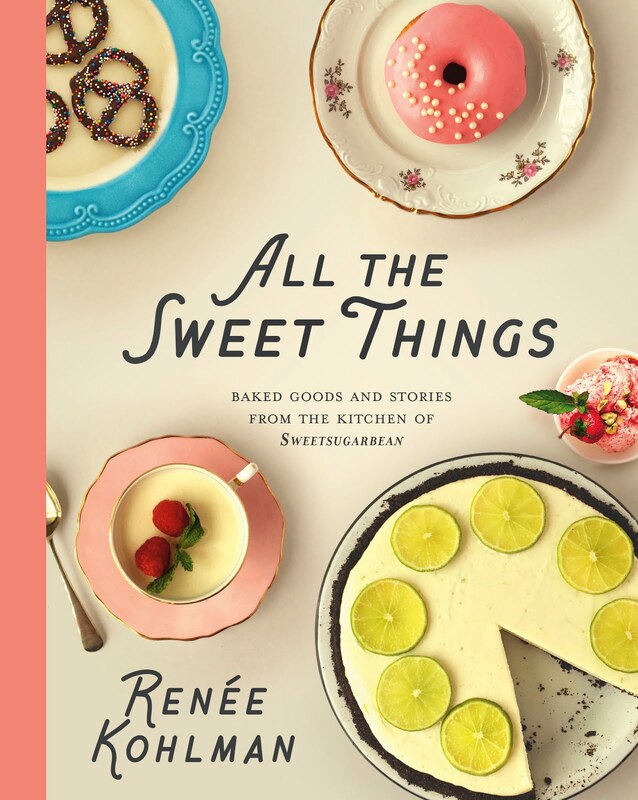 Beautiful post, Renee! Thank you everyone. Happy baking! Renee, Great post. Stopping here today makes me feel like the holidays really are here. Love you twinkly photos and your jam jams look just right. Heriloom recipes are the best - you can taste the past. Renee, we grew up eating these, too. My mother thinks she had the recipe from a Women's Institute cookbook or possibly a very large homemaking book for farmers' wives that her family just called "The Doctor Book" because there were sections dealing with human and animal sickness and their remedies. Anyway, I, too, have great memories of these and we may make some this year for old times' sake. Mum is nearly 90 now, so doesn't bake that often and I don't want to be baking (and then eating the lovely results) just for us. Christmas is my favourite time to bake anyway. Thanks for sharing your recipe. Ours used white sugar and no corn syrup, so I'm happy to have your variation to add to my collection. When the dough comes out of the fridge, can you roll it out right away or should it warm up a bit first? Good question. You can let the dough rest for about 10 minutes before rolling. If it is soft and pliable, you can roll right out of the fridge, but if it seems too firm, let it rest 10 min or until workable. Thanks! 1/4 inch isn't thin... is there a typo? No typo. You want the rolled out dough to be approximately 1/4 inch thin or thick. WONDERFUL recipe! I made these last year and neglected to leave my praise! Well, I just mixed them up and have them setting in the fridge - I LOVE this recipe - easy dough to handle, rolls out beautifully and the taste is heavenly! Definitely added to the list of Christmas baking! Thank you so much for sharing!